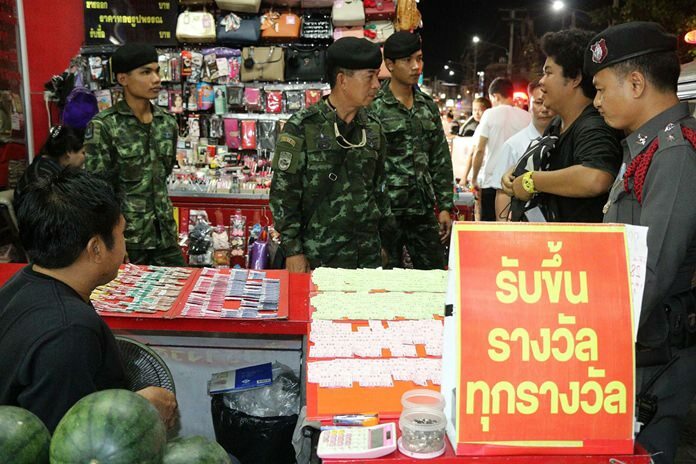 Police have arrested a Pattaya vendor for allegedly selling tickets for a variant of the illegal underground lottery that awards gold, not cash, as prizes. Phudit Lamjumjang, 42, was taken into custody at a table set up outside the gold shops at the Chaimongkol Market Oct. 15. Officers seized illegal tickets worth 1,500 baht. Police said Phudit confessed he had been selling the underground lottery tickets for some time that cost between 60 and 200 baht each. The more tickets a person buys, the more they can win if their two- or three-digit numbers match those drawn in the official government lottery. The scam is not new, with another vendor arrested in nearly the same place last year and a third captured in May 2015 in Nongprue.